💙 Accepted and started 2 new jobs – Brighton in November (mentioned in this post), and me last week! 💙 Started cooking at home a lot more, thanks to Blue Apron! 💙 Filed our taxes with a CPA for the first time! Last post, I discussed starting my photography business, enjoying the fall colors together, and my klutziness striking again. 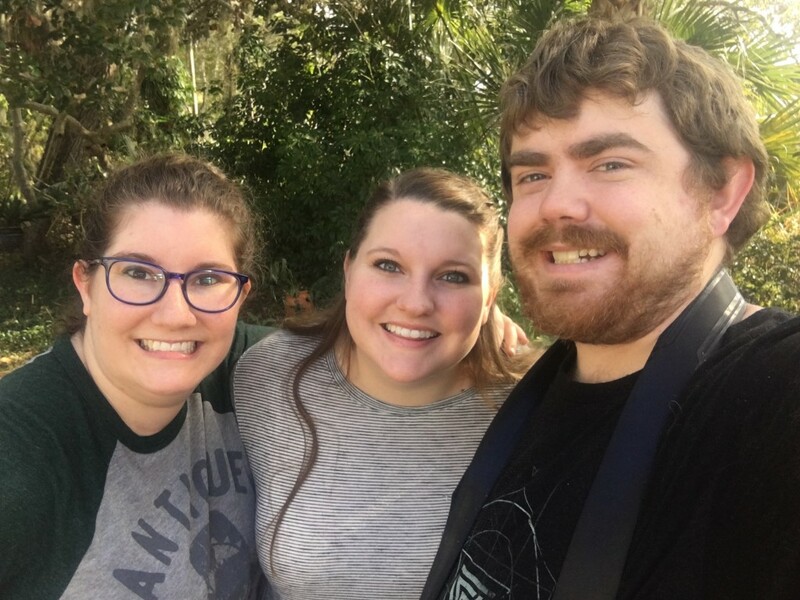 This was our last day in Florida before we flew home to Salt Lake. What I’ve learned is the only guarantee in life is change. I write this post as I have just accepted a new full-time position at a nearby CVB (Convention and Visitors Bureau). Since graduation, I’ve always wanted to work at a CVB because it’s the perfect hybrid of hospitality, events, and tourism. I had no intentions of taking a job, much less a full time job, but when I am determined to get something that I want (in this case, a house), I am willing to work to make it happen. Last weekend, we were reviewing information for the house, and I decided I’d like to make more income. It’s a slow time for photography in Utah, unfortunately. Upon searching for a part-time job, I saw this job opening that I felt I was perfectly suited for and I applied. Within two days, I had a job offer which I accepted. I am very excited to start this new adventure (and I plan on continuing my photography business as well, of course!). I started this week! In addition, Brighton and I have hunkered down and began the house hunting process. Of course, nothing is final until it’s final and in writing during this time. Last weekend, we attempted to make an offer on a house but it went “under contract” minutes before we signed the offer paperwork. Everyone told me not to get too “emotionally attached” to a house during this process, and with the hot real estate market in Salt Lake, everything moves at lighting speed! I would say that I’ve done a decent job of staying unattached to homes we visit. And frankly, they all blend together after seeing so many! It’s exhausting. We are currently under contract on a house, but like I said, nothing is final until we get those keys in our hand, so I am not going to get too excited until we actually have keys in hand and paperwork signed. The weather that we’ve been having has made me want to stay inside and be a homebody. It’s not snowing (right now) and it’s not sunny, and it’s just perfect weather to get things done. I was telling Brighton today that I am happy that all this house business is happening now rather than in the summer, so by the time summer arrives (hopefully), we’ll be in our new house. I’ve read a couple books in the last month or so that I’d love to recommend to my readers. The first is The Happiness Project by Gretchen Rubin. The book is her experience of her own personal “happiness project” over the course of one year. She first identifies different areas of her life that she wants to work on— energy, marriage, parenting, relationships, career, meditation, etc. Then she dedicates each month to a few “resolutions” that she focuses on to make her happier. She uses the word resolutions over the word goals because resolutions indicate continual progress rather than a goal where you reach it and stop working towards it. During the year, she keeps track of her progress on a visual chart showing each of the resolutions and gives herself stars. I loved the idea that these resolutions were small efforts to make herself more happy in very specific ways. I also thought her changes were small, but very effective. 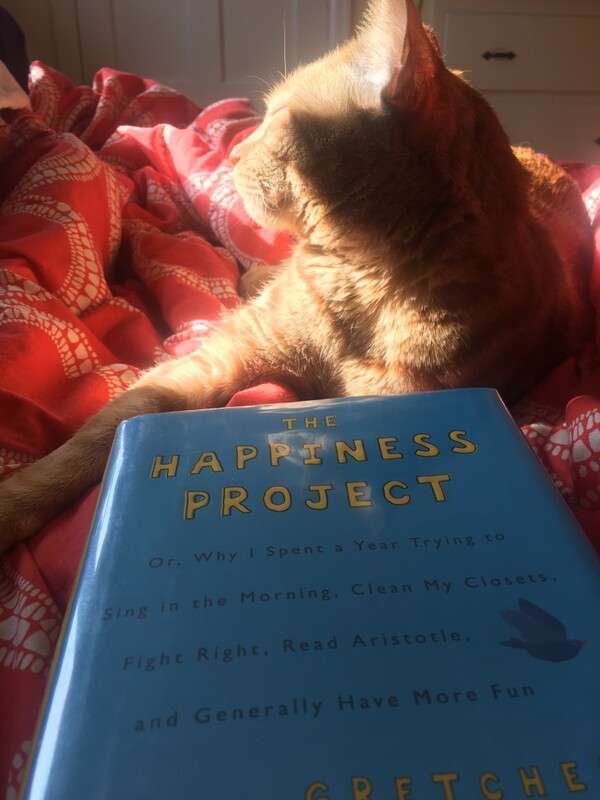 My sister also read the book recently and she said she wants to start her own happiness project! I hope she does. At this time, I’m not quite ready for a project like that, but I liked her research and her insight that I took away from it. A lazy weekend day spent reading in bed with my orange kitty, Oliver. 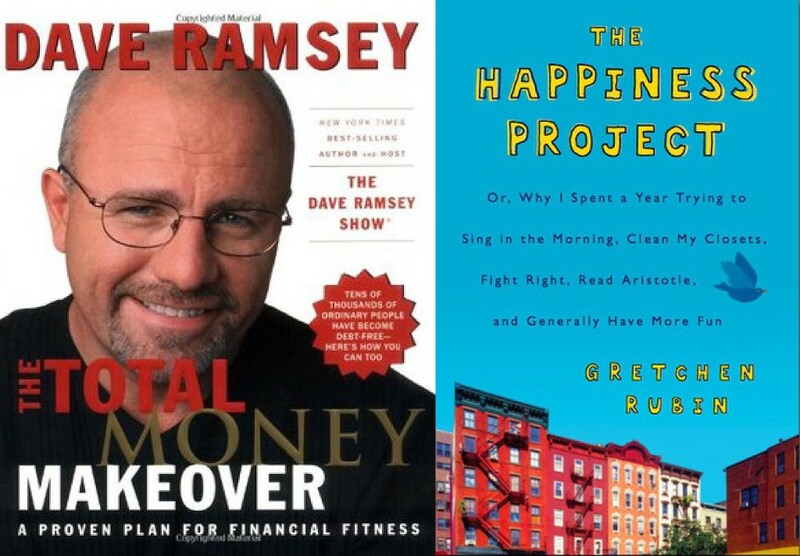 The second book I read was Total Money Makeover by Dave Ramsey. You make already know all about Dave Ramsey, but I actually hadn’t really known of him until I read some posts on Amy & Jordan’s blog. 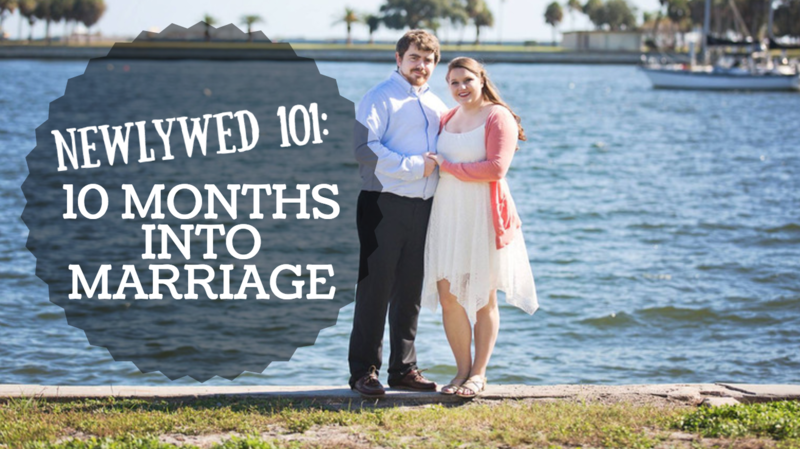 Brighton and I both have debt from our school loans that we’ve been trying to pay off, but it can be tough, especially with me just entering the work force a couple years ago. It was extremely insightful for me to read about how to tackle debt and save for our future. This is especially relevant as we are in the process of buying a house. In the book, Dave describes his 7 Baby Steps to take control of your money. I’m feeling empowered by his book (which I didn’t pay for— I rented it from the library! Yay for saving money and using free resources). It’s also another reason for my new job. I want us to take control of our money, so we can do the things we want to do in life. 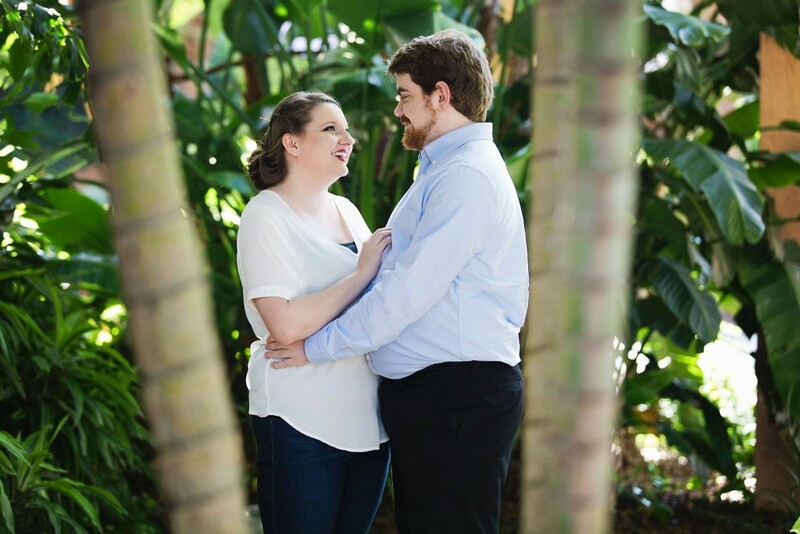 It’s only 10 months in, but I want to set us up for success. Even if you aren’t deep into debt, I felt that his suggestions on investing and saving for college funds, retirement, and paying off your home are great goals to work towards. It’s President’s Day Weekend, so I hope Brighton and I can get out there and adventure, even if it’s close to home this weekend. 🙂 Let’s hope for less gray weather this weekend!